Dubai: Steve Smith heaped praise on Australia Test captain Tim Paine's "exceptional" leadership, while admitting it's been hard for him to watch his national team from the sidelines. "Tim Paine has done an exceptional job and [so has] Aaron Finch taking over the one-day side," Smith said. "He's had a tough start to that with the performances of the team. If I get back and play under them I will do everything I can to help them out and help Australia have success." 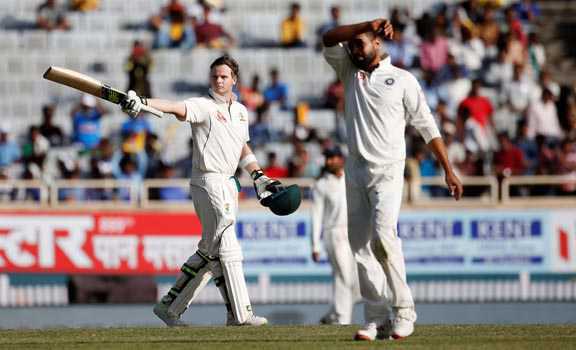 Smith, who is still serving his 12-month long ban imposed by Cricket Australia for his involvement in the ball-tampering controversy earlier this year, praised Test captain Paine and limited-overs captain Aaron Finch, who have taken the leadership mantle in Smith's absence. With Smith's ban slated to end in March 2019, the 29-year-old is eyeing an international return at next year's ICC Cricket World Cup in England and Wales, and the away Ashes series that follows immediately after. Meanwhile, he is focussed on putting the next three months to good use and has been playing club cricket for Sutherland. "At the moment I am pretty content with where I am at," he said. "We'll see what the future will hold. The next three months is about just preparing as well as I can to hopefully be a part of the World Cup and the Ashes." In the absence of Smith and David Warner, who is also serving a 12-month ban related to the same ball-tampering incident, Australia haven't had the best of runs in Tests. Their win in the second Test against India at Perth was their first since the first Test of the four-match series in South Africa, in Durban. They lost the last two Tests on that tour of South Africa, lost the two-match Test series in the UAE and then lost the opening Test of the home summer against India in Adelaide. Smith confessed the going has been tough for his team. "It's been tough at times, particularly when the boys haven't played their best in a couple of games and it's been hard watching and not knowing I can go out and help them," Smith admitted. "I was really proud of the way the boys played last week in Perth. I thought they were magnificent. I thought Tim Paine's leadership has been exceptional since taking over as captain.